Specialists in UV Glass Bonding to glass display stands and cabinets. Hyden UK offer a nationwide service to attend and carry out *on site UV bonding to glass display stands and cabinets. 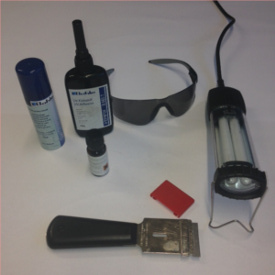 The process of UV Bonding uses specialist adhesive cured by ultra violet (UV) light. This process is relatively new but is an essential tool in maintaining glass furniture creating a crystal clear or highly transparent finish with a relatively short curing time and very high stability. Hyden UK can attend your premises and effect a **repair to glass cabinets, shelving or display units. Hyden UK provide a fast professional service at a very competitive price. *on site repairs can only be carried out on items that are manageable at your premises. **the item to be repaired must be in a repairable condition - both pieces to be bonded must be clean and no fragments missing.